The balance wheel and hairspring combine run at a particular rate, generally between 3 to 8 ticks per second. This is based on the elasticity of the hairspring and the mass and weight distribution of the balance. Adding weight or increasing the effective diameter of the balance will slow the rate down. Increasing the length or decreasing the springiness of the hairspring will also slow the rate down. 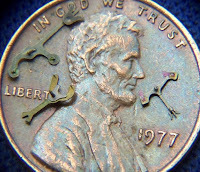 Older watches were "tuned" roughly by adding or removing tiny screws and washers to change the weight of the rim. Ideally these would be added in pairs, so as not to change the poise (see below). Watchmakers would have packages of washers, each adding a certain number of seconds. Fine adjustment would be made with the regulator, a movable slot that slides along the hairspring, changing the effective length. The mainspring attempts to turn the gears in the watch. The gears transmit this power to the escape wheel. When it rotates, it pushes on one arm of the lever, which in turn "kicks" the balance and causes it to rotate. The other arm of the lever blocks the escape wheel from turning more than 1/2 tooth. When the balance turns, it winds the hairspring until the hairspring is tight enough to make the balance go the opposite direction. The balance will then begin to move the lever--When the lever is released the arm blocking movement of the escape wheel releases it, gets another kick, and the first arm moves to block the escape wheel. This process repeats 3-8 times per second, depending on the watch. Consistency is the key to a well-running watch. Temperature, position, how far the watch is wound, magnetism and friction all have an affect on the rate. Much of the cost of a fine movement is in counteracting these errors. If the balance wheel is not perfectly poised (balanced), it will change how it rotates depending on the orientation of the watch-it may run differently when stem up than when stem down. This is known as positional error. On screwed balances this is adjusted by moving individual washers or screws from one screw position to another--This would keep the overall mass (and therefore the overall rate) the same, but change the poise. On smooth balances this is done by removing material from the proper spot on the balance rim. Traditional steel hairsprings change their elasticity or "springiness" at different temperatures. Old high-grade watches would counter this by having split bimetalic balances with screws. The rim of the balance was made of a sandwich of different metals, with different expansion properties, similar to a metal thermometer. Each half of the rim is attached at one end only, the other is free to move based on the temperature. Adding weight to the free end will increase the amount of temperature compensation. Adding weight to the rim near the spokes has little to no effect on temperature compensation. By moving pairs of washers to matching positions on their respective halves of the balance, temperature compensation could be adjusted without affecting poise or average rate. In the 20's, a new class of spring materials were invented that have little temperature sensitivity at normal temperatures. This allowed a smooth solid balance to equal the temperature performance of a bimetalic balance. While the rest of the movement can cause timekeeping errors, the escapement is key. Rough parts will not be as consistent as smooth, and will wear faster. Jewels in a mechanical watch are used to reduce wear and friction in critical areas. In modern watches these are synthetic sapphire or ruby. In watches before about 1902, these were actual mined gemstones--Sapphire or ruby for good watches, garnet for less expensive ones, and occasionally diamond for super grade watches. The typical jeweled wristwatch uses an anchor escapement, named after the shape of the lever. It will be at the same level as the escape wheel, and uses angled jewels glued in place where it contacts the escape wheel teeth. This gives the most consistent operation, and the best resistance to wear, but requires extreme precision in both manufacture and assembly. Jeweled lever watches would typically come in either 7 jewel models, or odd numbers between 15 and 23. 7 is enough to properly jewel the entire escapement. 17 adds jewels to all the train pivots. Jewels above 17 are of marginal value, and jewels above 23 are essentially useless. (This is only counting the jewels in the basic timekeeping section, not in additions like automatic wind modules) Watches with a single jewel are not considered jeweled. The picture to the left is of 3 watch levers--The one above the date is a jeweled lever, the clear red blocks are jewels. A pinlever is more forgiving. giving up precision in operation and long-term durability for ease of manufacture and in some cases impact resistance. The pinlever is simpler, usually stamped sheetmetal rather than the more complicated assembly of a jeweled lever. It sits below the level of the escape wheel, with round pins extending up to engage the escape wheel teeth. The shape of the pins requires a different shape of escape wheel teeth, and the interaction of these parts is compromised. Friction is higher, and is generally compensated by using a stronger mainspring, which also adds wear. These may use a layout similar to the anchor, or have a different angle between the pins and the tail. Both levers behind Lincoln's head are pinlevers. Pinlever watches are most often either unjeweled (the traditional mechanical Timex) or have a single jewel (most Swiss and Hong Kong pinlevers). There were some pinlever watches with jeweled pivots--many of these would get extra useless jewels so they could claim "17 jewels" or more. These were a bit better than their unjeweled cousins, but not as good as a seven jewel with a fully jeweled escapement. Timex had a wierd hybrid--a 21 jewel version of their basic unjeweled pinlever, with shaped, jeweled pins. Fascinating I never knew what the jewels meant. Great post. I assume that you take the photos yourself. "How to photograph tiny objects" would make a very cool post. Can anybody offer any feedback as to how the cheap mechanical (presumably pin lever) skeleton pocket watches would keep time compared to a basic Civil War era Waltham or Elgin pocket watch? Now I know about pin lever escapements. Thank you. The skeleton pocket watches that I've seen at Walmart and similar use a low-end jeweled wristwatch movement extremely similar (possibly identical) to the one I used in the upper picture. I don't think anyone has produced a pinlever movement for decades. If the 1800's Elgin or Waltham were well maintained, its accuracy would almost certainly be better than the modern Chinese skeleton movement. Hello: This is a most useful information. I have a Gallet circa 1915 7 jewels pinlever chrongraph with the 3364 movement a Hanhart Tristop circa 1969 with pin lever and 7 jewels too. I wonder why the two chronos have pinlevers and 7 jewels. The Gallet advances 10 sec/day after almost 100 years. Gracias. I'd never heard of a 7 jeweled pinlever before, so I had to do some Googling. The current Hanhart site shows that they still make 7 jeweled pinlevers, and an illustration showed that the pins are actually cylindrical jewels rather than the much more typical steel pins. I would guess that jeweled pins would be somewhat better than steel pins while requiring less precision in manufacture than traditional lever jewels--although it may be that jeweled pins are used mostly for marketing reasons. 7 jewels is probably more than adequate for a stopwatch that will only run intermittently, as opposed to a watch that would run 24 hours a day for years--that would allow jewels where they are most likely to affect accuracy, omitting the jewels whose primary purpose is durability.